In February 1996 a small notice appeared in the International Jerusalem Post weekly newspaper. It announced the opening of the Arava Institute for Environmental Studies at Kibbutz Ketura. The notice also contained the email address of its founder Dr. Alon Tal. With my interest in the environment I wrote to Alon to see if I could be part of the Institute during my upcoming 11 month sabbatical later that year. At the end of extended correspondence, both Kibbutz Ketura and the Arava Institute took a chance in allowing us to come to the Kibbutz and Institute that fall. There is much I could say about the first magical year of the Institute and perhaps I will return to that in later blogs. All I will say for now is that the Institute was, and is, the place of so many of my interests and passions: peace, the environment, multi-cultural education, kibbutz, desert, the best of Zionism. So here we are 20 years later on our fifth long visit (they range from six months to two and half years). We plan to be here until the end of January 2017. I begin most days with a bicycle ride through the Kibbutz date orchards, past the 40 megawatt solar field, and then arrive at the desert border with Jordan. I was fortunate to travel a lot growing up, and so I always had a fascination with maps and borders; drawing maps was something I loved, and still love to do. So it is natural for me to be drawn to that spot. But there are other reasons why I love riding my bike there. For one, it is peaceful and quiet. 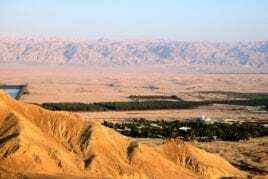 It is no accident that in the Jewish, Christian, and Islamic traditions the desert is a place of quiet contemplation and revelation where, as it says in the Bible, “the still small voice” (1 Kings 19:11-13) can be heard. The other reason I am drawn to that spot is that the border there does not go in a straight line but makes four 90 degree turns that frame the fields of Kibbutz Ketura. It is a sign of compromise between Israel and Jordan. When it came time for the Peace Treaty between the two countries to be signed in 1995 (at a spot along that same border further down the Arava valley), there were some changes made to the Armistice Line of 1949. Jordan could have demanded that those parts of the Ketura fields remain in Jordan but as a sign of being a good neighbor, instead said, let the border literally reflect a give and take. It remains a quiet model of compromise when it comes to land disputes between countries in this part of the world. Along the border there are the official border markers that have been placed every 500 meters. As well as the markers, there is the barbed wire fence that also demarcates the border. Being that this border is in the desert there is a lot of sand or more precisely sand dunes. Sand dunes are not static but move with the desert winds. They also don’t know about or care about fences and borders. So it is not unusual for the official border to be swallowed up and buried by the moving sands of the Arava desert. It is one of the reasons why we say at the Arava Institute that Nature Knows No Borders. And if nature can transcend those differences so can people; which is part of the work of the Arava Institute.